As a Cuban from the Island —and all Cubans are, no matter how far and how much time has passed since we left or were expelled from the Island—, as a critical intellectual —that is, a writer and photographer who believes in the beauty of truth, even when nobody listened— and also as a Cuban from the exile, of course —because all Cubans are as well, no matter if we still live inside the Island, where we are “inxiles”—, it’s a privilege and a great honor to be invited here to share my experiences and my vision with you today. I hope that my words can give voice to the countless alternative voices that exist and resist in my country. These are real men and women who cannot live normal lives in their birthplace, since their whole existence is disrupted day by day —and decade after decade— by the perverse nature of a regime never elected by my people, by the propaganda machinery and the impunity of the political police, in a despotic version of socialism that, as in any totalitarian State, starts by abolishing private property, only to end up destroying private life as such, harassing citizens whether or not they become aware of the power of the powerless and decide to bear witness to their own reality. Indeed, the concept of citizen itself is officially obsolete inside Cuba, since the term is used exclusively by the authorities when the police carry out a detention or when a tribunal opens a trial. So, if they call you “ciudadano” (citizen), then you know you are lost even if you are innocent or, worse —as in a Kafka novel—, even if you don’t have any idea of what you are guilty of. Therefore, perhaps the crime is the social process itself. On the one hand, I speak here quite confident, after so many walls that seemed would never fall and yet they did fall in the last 25 years. On the other hand, I also speak so very worried in front of other walls that should have been brought down already and still have not been. I’m particularly concerned about the new walls that many governments seem to be building, in a battle that may well be developing in perfect peace, little by little, corroding the basis of democracy on our planet, by the use of democratic disguises that hide the intentions of the system, until it’s too late for the people to react and get rid of the oppressors. 1. Not only after the military takeover of January 1st 1959, but before the victory of the so-called Revolution, the confidence of a whole nation was betrayed by secret agendas that involved the hegemonic potencies of the Cold War world back then, plus the never-ending hunger for power of Fidel Castro and his closest followers. Believe it or not, many of those men —those who were not devoured by the rage of a Revolution so similar to Saturn, who eats his own children— those men are still alive and in absolute control in Cuba now, although they are not mentioned in the manipulative billboards of the CubaNow campaign that this month is being displayed in the stations of Washington DC metro. This gerontocracy is an elite so cynical as to call themselves “the historical generation”. Or maybe they are just being transparent, since it’s really impossible that history will forget or forgive this generation created in the image and likeliness of the Maximum Leader. Thus, despite the previous dictatorship, in 1959 Cuba lost a democratic republic with a then recent Constitution that even today would be considered a paradigm in the recognition of differences within unity. 2. In the 21st century itself, in this 2014 that looked like science-fiction for the teenagers that we were in the late 80’s, a Transition is now taking place in my country, but not from Law to Law —as in the Spanish democratization model— but from Dictator to Dictator, in the Caribbean style, including a dynastic tradition of blood: from the original Castro to his brother Raul; then, when he steps down most likely after 2018, to his daughter Mariela (now Deputy in the National Assembly of People’s Power) or to his son Alejandro (a high-ranked intelligence officer, the much feared tropical version of Vladimir Putin and other autocrats of the kind), or to both. Indeed, since its independence from Europe centuries ago, Latin America is a region devastated by criminal caudillos that call themselves Liberators, Saviors, and ultimately Fathers of our homeland. So, 55 years after the enthusiasm of a Revolution, just when the light at the end of the tunnel is a growing illusion in the soul of my nation —inside and outside the Island—, once again a secret operation is on its way to abort our hopes to be free. However, nowadays an emerging civic society is peacefully struggling in Cuba, face to face against such a transition from Communism to State Capitalism, a strategy for the system’s survival that relies on the populist regimes of the region, on geopolitical globalization, and on the irresponsible greed for profits of both foreign and, most sadly, Cuban investors living abroad, the majority in the United States, now under an administration that, like European Union, seems more than willing to “normalize” the relations with an “abnormal” regime, disregarding the violations of human rights in Cuba, as part of a time left behind long ago. Thus ensuring, by the way, a fossil future for all Cubans wherever we may live. The rationale here appears to be that, if democracies cannot prevail over the enemies of freedom, then it’s better to make an alliance and, preferably, to do business with them. In free nations maybe nobody conceives a Cold War II scenario, but the rationale of totalitarianism is totally different for sure. Please, allow me to re-write the famous poem of Allen Ginsberg: America, you’ve given them all and now you’re nothing… I wouldn’t like to be the spokesman of bad news for the Western world, but next time we take a close look at the politic equilibrium in our hemisphere, for example, we might be surprised that it will be too late to react and get rid of the oppressors. Dear friends: since I became an independent blogger and journalist in Cuba, I was told, by the former Minister of Culture, Abel Prieto, and the former director of the Cuban Book Institute, Iroel Sanchez, that I will never publish again in my country. They were both removed from their positions later (Saturn’s law), but the unholy war of the Castros against critical intellectuals goes on and on. While I talk here, the Havanan novelist Angel Santiesteban languishes a 5-year sentence for a common crime announced to him —by State Security agents— as a punishment for his opinion columns in his blog: Los hijos que nadie quiso /The Children Nobody Wanted. While I talk here, a journalist from the free-lance agency Hablemos Press / Let’s Talk Press, Calixto Ramon Martinez was kept many months in prison for reporting an outbreak of cholera in Cuba, which still constitutes a serious health risk there, even for tourists, a fact that the Cuban government refuses to recognize in its due importance. Finally he was released without any explanation, documentation of his case, or at least an attempt to give him an apology or indemnify him. While I talk here, a Catholic Afrocuban young mother and her husband, both peaceful pro-democracy activists, Sonia Garro and Ramon Alejandro Muñoz, have been for two years and two months in several Cuban prisons, subject to physical abuse and isolation periods, just because they protested when they were forbidden to attend the Holy Mass of the Pope Benedict XVI in the Revolution Square of Havana city, in March 2012. Hundreds of human rights activists were then arrested, including me, kidnapped for three days with my girlfriend, apparently accused of attempting to take counter-revolutionary photographs of His Holiness with the Heroic Guerrilla Ernesto Che Guevara behind him, in the façade of the mysterious Ministry of Interior where the mass took place. While I talk here, an American citizen under contract by USAID, Alan Gross, is being held hostage since December 2009 in a Cuban jail, serving a 15-year sentence for charges that included espionage. A Jew himself, he was just helping the Cuban Jewish community to have a ready access to the internet, since the right to independent information is not recognized by my government. In fact, it constitutes a major crime: enemy propaganda, diffusion of negative news, among other brutalities of our actual Penal Code. This was a miserable mafia message thrown to the fair-play face of America: mind your own business, do not dare to try to help the Cuban civic society or you will pay a dirty price too. Besides, dozens of well-known terrorists have found safe haven to grow old in Cuba and take care of their families and their fortunes, after a whole life devoted to international delinquency, including USA fugitives, ex CIA agents and hit-men associated with dictators and paramilitary bands worldwide. To put an end to this very limited list —which cannot explain the thousands of death penalties by firing squad nor the untold number of Cubans dead in the Florida Straits trying to escape from our proletarian paradise— on July 22nd 2012, a car with two Cubans and two foreigners was intercepted in a remote province of Cuba. The two foreigners, young politicians from Spain and Swede, were beaten, taken away from the scene, drugged in a hospital, incarcerated, and threatened with death if they did not accept —in a public video shown by Cuban TV— that they just had had a car crash. The two Cubans were assassinated, God knows if after one of those private “revolutionary trials” on the spot, so frequent at the beginning of the Revolution, on the very highway that remained closed to car traffic for over an hour. Their names were —their names are and will always be— Harold Cepero and Oswaldo Payá. Payá was the leader and is the founder of the Christian Liberation Movement. He won the Sakharov Prize for Freedom of Thought from the European Parliament in 2002. He was a dear friend to Lech Walesa and Vaclav Havel. And certainly he was the main candidate to conduct a true Transition to Democracy in Cuba, and maybe he could have turned into the first president of the free Cuba that is to come. A liberated Cuba that our government is indeed delaying thanks to deaths like these and that of Laura Pollan, the leader and founder of the Ladies in White Movement, also a winner of the Sakharov Prize from the European Parliament, in 2005. The family of Oswaldo Payá is now looking for solidarity to open an independent investigation upon this extrajudicial killings, where Harold Cepero was cruelly considered just a “collateral damage” to the murderers paid by La Habana (maybe they were not even Cubans, so that’s easier to make them disappear now). In the middle of all this tragedy, I kept writing and taking pictures out of the ruins and the splendor of my beloved and lost La Habana. In the middle of all this pain, hypocrisy coming from my neighbors and relatives and even from the hierarchy of the Cuban church, many have kept informing the world about our unreal reality. Surrounded by a lot of apathy, but also with the pleasure of staying to work for the well-being of the only spot on the planet that we can call our home. Surrounded by hatred and hopelessness, I hopelessly fell in love there, with someone more courageous and with much more peace in her heart to struggle for freedom in my homeland, after half a century of civil apartheid, military impunity, lack of solidarity from the international community, and a massive anthropological damage that has turned Cuba into a post-national country that only cares about escaping from itself, and where disappointment is paving the way to defeat for those of us who still cherish hope. We, Cubans, do need your help now, please, to overcome all the frustration that is extending its roots in a people that has been traditionally noble, friendly, truthful, hard-working, brave, fond of freedom and also full of joy. Dear friends: I won’t be the spokesman of bad news for this session, but let’s not forget for a minute that the oppressors are active out there, and they have an incisive instinct for self-preservation. Allow me to finish by re-writing the Cuban repressed and finally exiled poet Heberto Padilla, with his “Prayer for the end of the century” / “Oración para el fin de siglo”: Nosotros, hijos y nietos de terroristas melancólicos y de científicos supersticiosos, sabemos que en el día de hoy está el error que alguien habrá de condenar mañana. We, children and grandchildren of melancholy terrorists and superstitious scientists, we do know that deep in today lies the error that someone shall condemn tomorrow. Contrary to the famous and infamous speech of Fidel Castro in 1953 —“La Historia me absolverá” (History will absolve me) —, the world may absolve them, it doesn’t matter. History will condemn them anyway. Note: The speech was written and delivered in English. Prolific, brilliant, celebrity, provocateur, agent, incisive, insidious, one of the last intellectual icons of the Latin American left has died: Gabriel García Márquez, el Gabo. In the early 1980’s Cuban adolescents read and loved García Márquez. 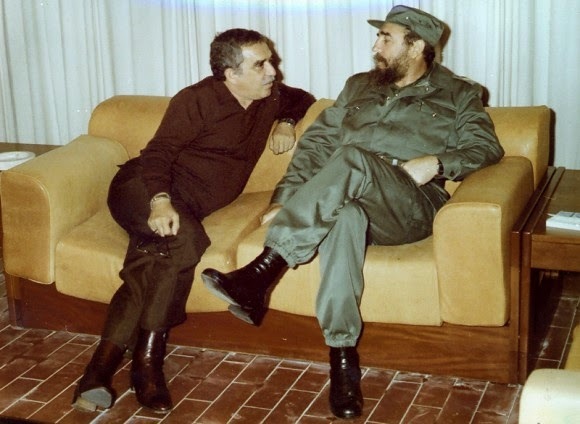 In Castro’s Cuba, García Márquez’s books held a mirror up to Cuba’s “official culture,” dictated by Fidel Castro, that also reflected the Soviet Union and its Socialist Realism. Castro was obsessed with his control of the island’s cultural affairs, and even the best Cuban writers of the time were forced to imitate the worse of Soviet propaganda, stopped writing, such as poet Dulce María Loynaz, playwright René Ariza, and the novelist Reinaldo Arenas, jailed or fled in exile such as Heberto Padilla, Lydia Cabrera, and Guillermo Cabrera Infante. There were many others. In his 1982 Nobel Prize speech, García Márquez courageously recounted the repression of Latin America’s military dictatorships, civil wars that led to genocides, and the state terror that killed hundreds of thousands and forced millions to leave for Europe and the United States. I was in secondary school at the time. I had read One Hundred Years of Solitude, and like many other young Cubans considered Gabo the most important writer in the Spanish language of all times. As my generation grew up and began to express our own truths, it became our turn to be repressed. (I haven’t been able to work or publish in Cuba since 2008, when I created a blog Lunes de Post-Revolución.) 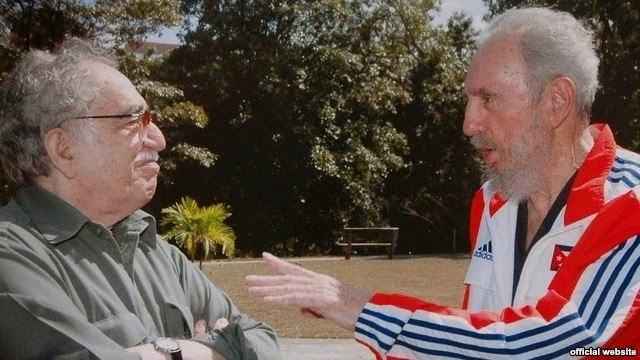 In 2003 during the Black Spring, when three young Cubans were shot and 75 political dissidents were arrested and sentenced to 28 years in prison, García Márquez took notice of this other face of his friend Fidel Castro. 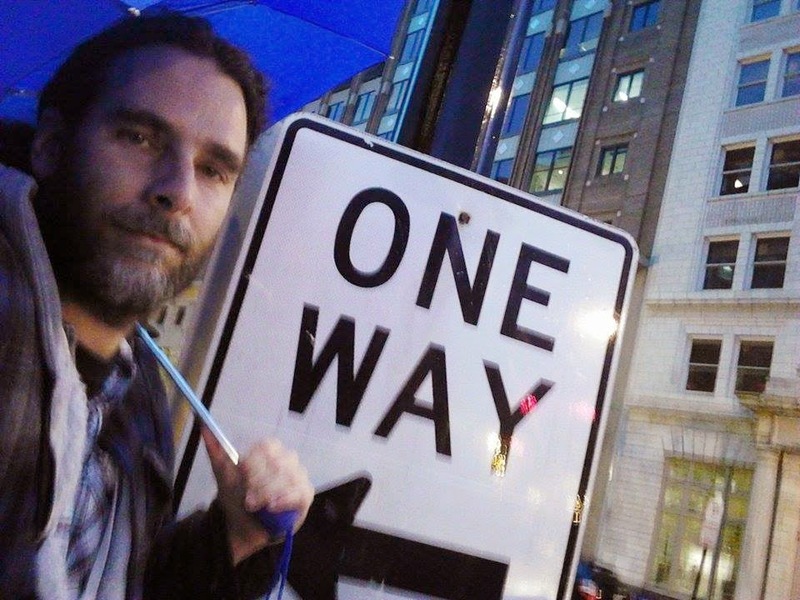 The word “but” is quite a dangerous monosyllable for anyone living under a monolithic ideology. In Cuba, Fidel Castro’s speeches are baroque rhetoric incarnated; he could speak for hours. Only for García Márquez was there an intellectual hidden in his speeches-in-chief. García Márquez fell in love in the time of the Revolution and got lost in its totalitarian translation for the free world. 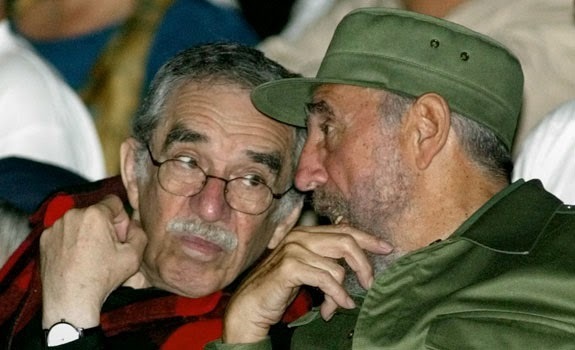 Gabo had to believe that the crimes of Castroism were justified by “historical necessity,” Fidel’s wisdom, and other Marxist or “magical” categories. Otherwise, his fidelity over more than five decades cannot be understood. Nor can the considerable time he spent in Cuba, enjoying the mansion and other privileges he was provided, while ignoring the plight of Cubans —repressed writers included— all around him. After half a century of solitude and without much sense of solidarity with pro-democracy and human-rights activists in Cuba, Gabo has died, and now there’s no one left with his intellectual firepower to provide cover for the Leader Maximum.